A couple of days ago, we released Sandvox 2.5.5 (quickly followed by an almost-identical 2.5.6 for direct download only). As usual it's a free update for all Sandvox 2 customers, available from the Mac App Store or directly in-app, depending on where you bought it from originally. There's quite an assortment of bug fixes included; see the release notes for full details. Want to create a link to a file that you haven't yet added to the site? 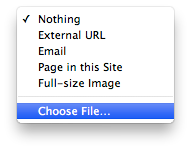 We've added a quick shortcut in the Link Inspector to add a file and link to it in one go. When running through the Host Setup Assistant, Sandvox detects if your host requires the use of a particular character encoding and automatically applies it (before, the app would prompt you asking to set the encoding manually). Of course you can still adjust the encoding manually if desired/needed. A handful of customers we've come across are publishing websites that are entirely password-protected. If that protection is already turned on while testing the host setup, the new version will neatly prompt you for the site's password if needed. Building a collection of photos of varying proportions? We've added a new option in the Photo Grid's Inspector to control how thumbnails appear. Select "Scale to Fill" and they'll all be the same shape by cropping the thumbnails as needed.